Jim Samuels stood on the platform on the back of the yard offices at River City. He scratched his head and half-smiled as he thought about the meeting that he just left. 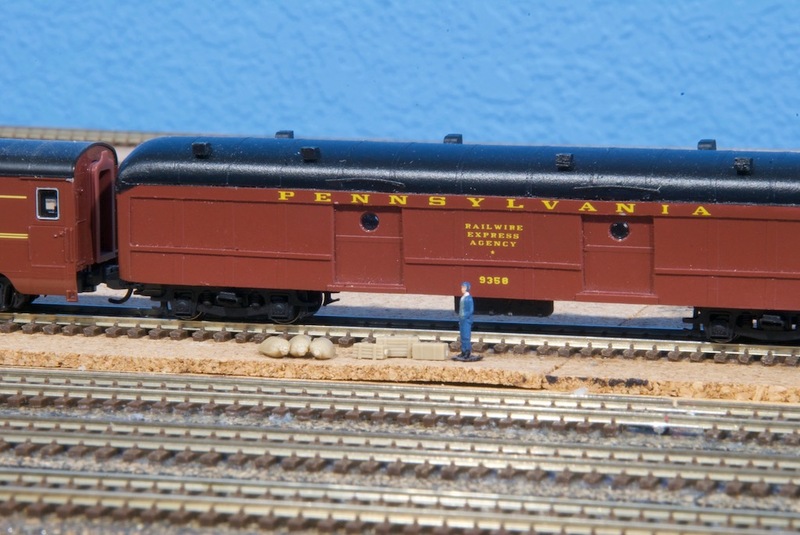 Despite the best efforts of the REA's agent, Carl Frost, The RailWire group had finally secured the lease of a messenger baggage car from the Pennsylvania Railroad. The negotiations had been long and drawn out, with Carl showing up at every opportunity to object and generally raise hell. Somehow, those RailWire guys managed to wear him down every time and send him packing with a snarky comment. Finally, today's meeting came, and Jim was introduced to the management as the messenger who had been hired to protect the group's shipments. Jim's first assignment was to catch the yard speeder over to the paint shop and inspect the car as it rolled out. Jim arrived just as a BS-10 was pulling into the paint shop. A few minutes later, it slowly pulled out B60b #9358. Jim climbed aboard and looked over what would be his home for the next few months. The facilities were functional, if spartain. He looked out the porthole windows and chuckled. He thought, "This ain't no Pullman, but at least I don't have to share it, 'cept with some boxes." The RailWire folks were eager to get their new car into revenue service. 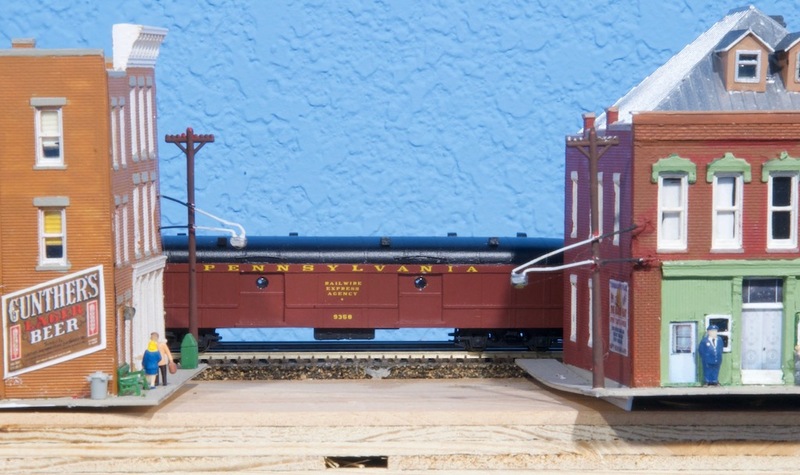 Finding no reason to delay, Jim waved to the BS-10's engineer, and he was towed over to the platform tracks. 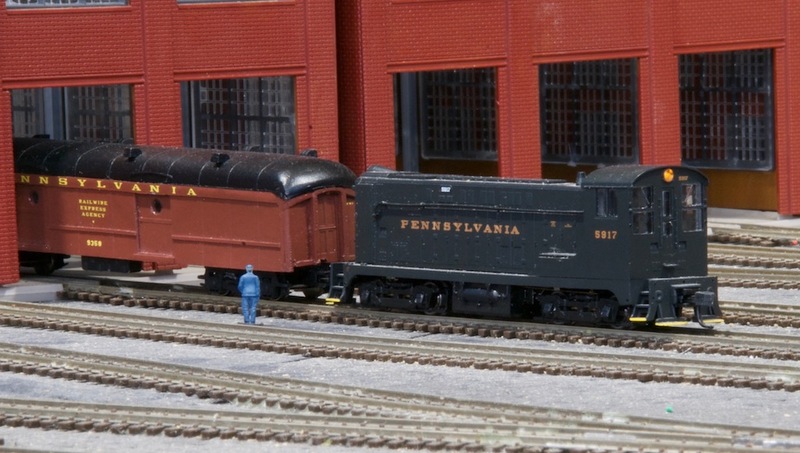 After some jostling around, Jim emerged to find himself at the head of the Pennsylvania Limited. "Well ain't that James Dandy," he thought as he jumped down and secured the doors to await his first cargo. He wasn't waiting long before a baggage cart appeared. Before Jim could greet the driver, the guy unceremoniously dumped several bags and crates on the ground right at his feet and scurried off with his cart. "Alrighty. Guess I'll be loading this by myself," Jim grumbled. The load consisted of a few bags bound for Denver, and a few crates bound for Lewistown. "They better start moving more than this, or I'm going to be out of a job faster than you can say, 'Where's Ed?'" Jim finished loading the cargo and climbed aboard. A few minutes later, he heard two blasts from a T1 whistle, and felt the train lurch forward. He peeked out the porthole as his car left the end of the River City platform and began its journey. The train picked up speed as it moved through the suburbs and out toward Pittsburg. Jim felt his car leaning hard into the curve leading into the bridge over the Sacramento River. "Gonna be a long trip," Jim thought as he settled in for the journey. The next day, Jim found himself glued to the porthole as the train climbed the Rockies. He watched the light change as the sun filtered through the mountains. Eventually, Key tower went by. By that time, the train was already slowing for its station stop at Keystone. Jim saw a few cars spotted on the siding across from the station. 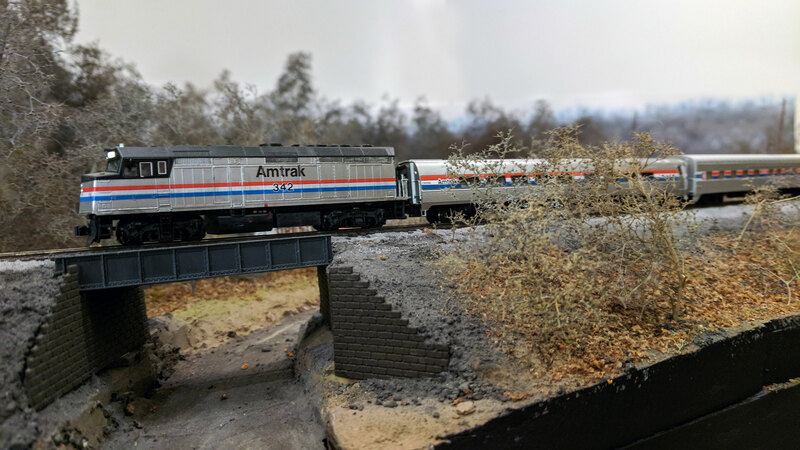 Jim looked out the other side past the platform and saw the progress on the nearly complete ski resort that the Pennsylvania Railroad was building at the site. Jim shook his head and chuckled, "What will they think of next." After leaving Keystone, the train blasted through the Cassatt Tunnel and begin its decent through the Clear Creek Canyon. Passing through Idaho Springs, he caught sight of a little bar where he had attended several informal meetings with the RailWire group. Finally, Jim heard the T1 begin to blow for grade crossings. He knew what that meant. He looked out and saw the Coors brewery going by. It was just a few short minutes to Denver, and his first delivery. Jim found himself enjoying Denver and nearby Golden, but before long it was time to move out again. This Railwire Express Agency endeavor seemed to be happening for real. With some excitement, Jim watched a very large crate being loaded into his car bearing the name "E. Brown" of Hill Valley, California consigned to Libya (of all places) and labeled "Used Pinball Machine Parts" with an odd instruction "not to exceed 88 MPH." Oh well, Jim thought, who cares what the lading is as long as it's been paid in full. With a flurry of electrical sparks and several bright flashes and accompanying bangs, his car suddenly began to slow. With deafening flange squeal the B60b eventually came to a stop. Jim slid open the door. With some amount of confusion, he noted that he was no longer on the Plains east of Denver. He was near a depot. The sign read "BASALT" and bore the unmistakeable logo of the Colorado Midland Railway...the Pikes Peak Route. Jim was a student of ferroequinology and knew that this couldn't be. The Midland had pulled its tracks from this place right after the Great War. As bewildered railroaders surrounded his car, he had no choice but to confront his new reality. He began unloading his lading to figure out what had happened. From his new colleagues, Jim discovered he was in 1905. Monday, October 2d, 1905, to be exact. The Midland was very much a going concern in 1905, and what it lacked in track maintenance it made up for with heart. Jim decided he'd best keep his knowledge of the Midland's early demise to himself. As he still had lading destined for Lewistown, Pennsylvania (and eventually Libya, apparently), he needed to start heading East again. The Colorado Midland crew offered to cut the baggage car in ahead of the day express over Hagerman Pass. "We can try to get you as far as Colorado Springs" the conductor said "but I gotta be honest...that thing is the heaviest and longest car this road has ever seen. We've got 50 pound rail in spots...we'll try to take it as slow as the timetable allows." 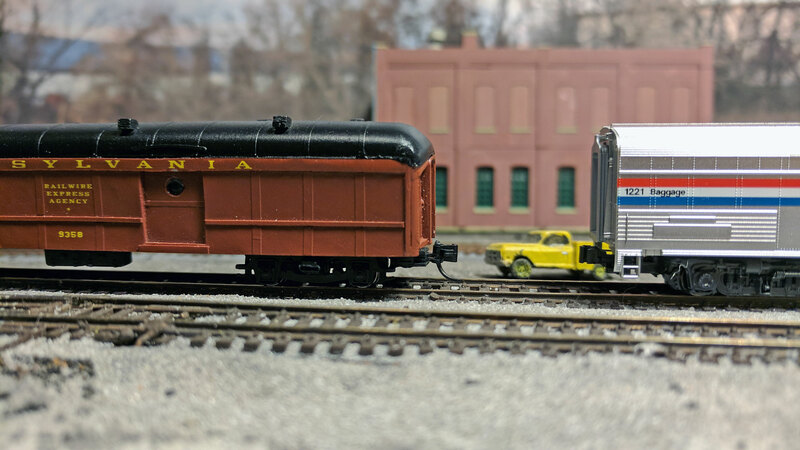 Jim realized that this was probably the first (and only) all-steel car Midland rails would ever see. 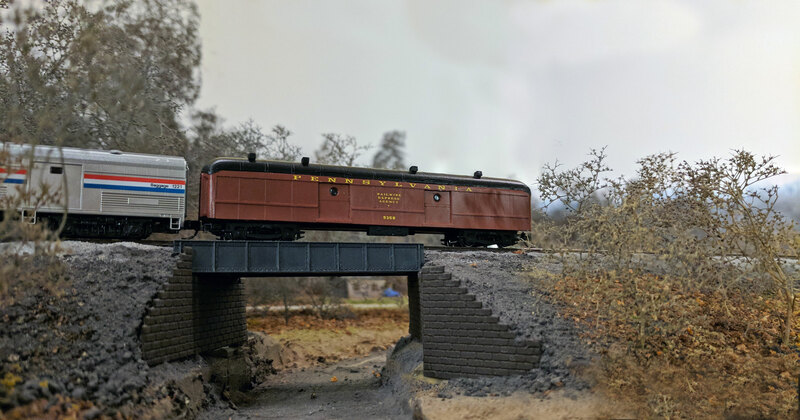 With the spin of the drivers, class 102 4-6-0 #34 kicked in and carried Jim and his rolling experiment eastward along the Frying Pan River. The ascent to the 12,000-foot Hagerman Pass was thankfully uneventful. Once on the Atlantic side of the Continental Divide, brakes were tested and the descent toward Leadville began. 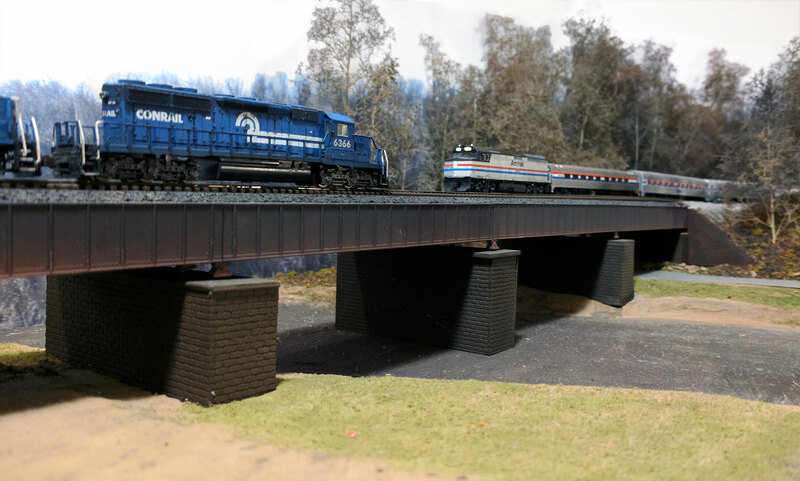 However, the rickety Hagerman Trestle and its 2% grade had other plans for Jim and the 9358. When she rolled, she took #34's tender with it while also pulling the D&RG combine off the rails behind it. Teetering over 100 feet above the river below, Jim thought "This is some bullsh*t right here." 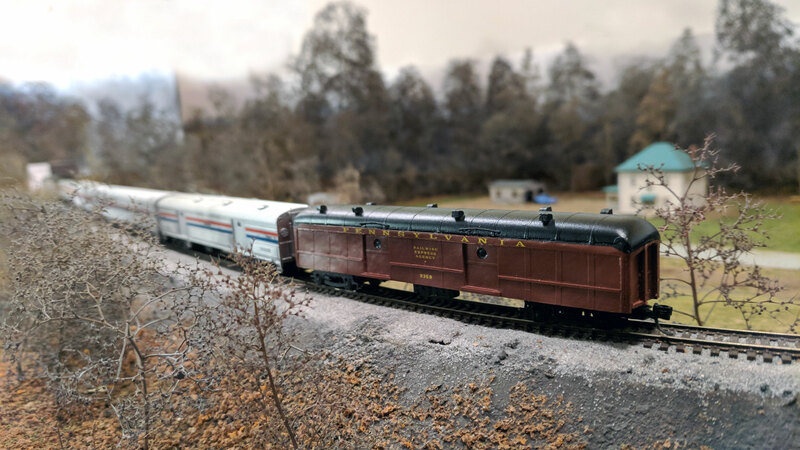 Without warning, the temporally-displaced B60b broke free and began accelerating down the 4% ruling grade toward Arkansas Junction near Leadville. Rolling ever faster Jim was at once thankful that he was onboard when the car broke free and terrified that the light rail and lack of tie plates would send the 9358 into the abyss below. Jim thought it was over. He must have hit #49 head on. He must be dead. But he didn't feel dead. In fact, he had the sensation of moving. Jim peered out of the porthole again. He was indeed moving. The scenery outside was decidedly greener and less vertical. As he sailed over a bridge he noticed a road below with automobiles. He certainly wasn't in 1905 anymore, and this sure didn't look like Colorado. Looking out the other side of the car, a keystone-fronted M1b roared past on an adjacent track. This was the Pennsy at least, and probably close to the right year. He looked down at the E. Brown crate again and knew this must be the culprit. He found another note pinned to it written by Dr Brown to a Rick Sanchez thanking Rick for letting him borrow something he called a "portal gun" and to say hello to Morty. Jim determined that this package had become too much trouble and that he was going to dump it at the next stop. 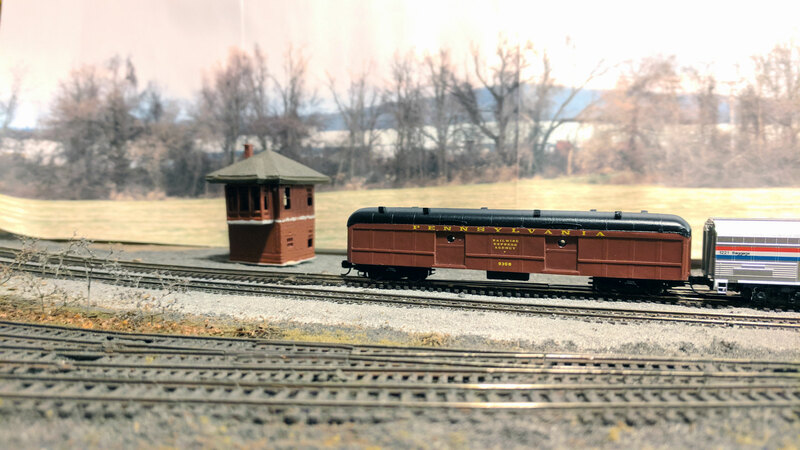 From what he could determine, he was on an eastbound somewhere on the Juniata Division behind a pair of K4s. In this time and dimension the Pennsy apparently only went as far west as St Louis. will it reach 88 mph ?? 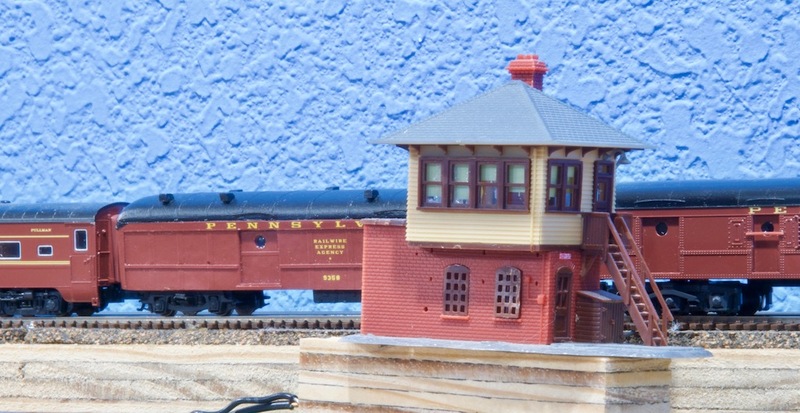 Jim's train came to a stop and with a sharp pop, his car was uncoupled to be set out. 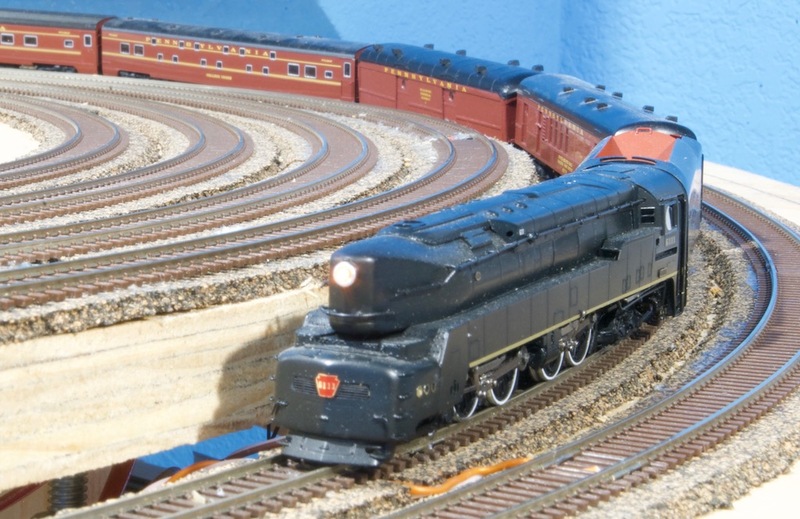 On an adjacent track, a PRR class L1s 2-8-2 simmered patiently. 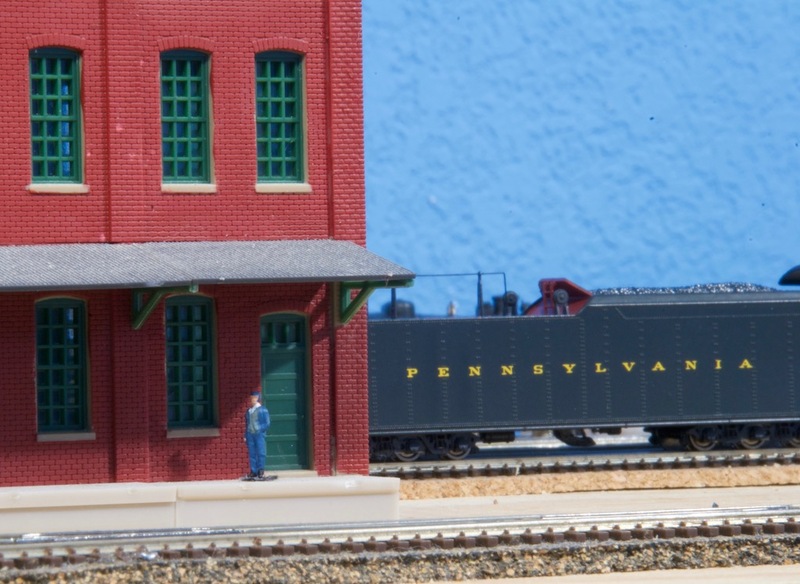 From the iconic depot tower, Jim instinctively knew this was Lewistown, PA, exactly where he needed to be. Whether it was "when" he needed to be was yet to be determined. His car was set out behind the Lewistown depot. With a sigh of relief he inventoried his lading and picked up the next shipment. 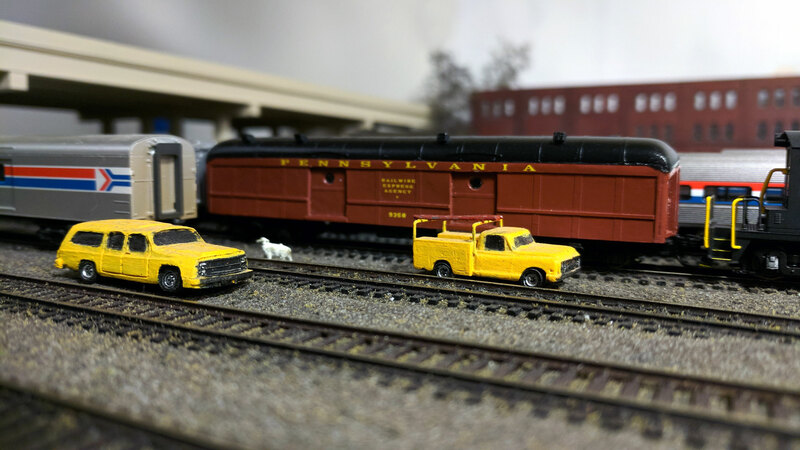 From Lewistown to Baltimore by way of the Northern Central, he was to deliver one live sheep and one 55-gallon drum labeled "Industrial Strength Personal Lubricant" to an Ed K. in Towson, MD. Jim wondered if after that delivery it would be too much trouble to run the car through a washrack equipped with holy water. What a great story Dave! The suspense is killing me! Poor Ed. And I feel sorry for the Ewe. 55 Gallons? Wow. That was incredible. It really sets the tone for the rest of the journey. Things are gonna get weird in Pittsburgh, Morty! It’s been a while since anyone heard from the car. That’s because it got “lost” on its way east. Burned up brake shoes were discovered while the car was being serviced in Chicago’s 14th St coach yards. Of course, being out of the ordinary (and far from compatible with Amtrak’s equipment), the car sat while waiting for a solution. Really, nobody wanted to touch something that was a “relic” and reeked of liquor and sheep dip. The Railwire Express Agency car in the 14th St Coach Yard in Chicago. Eventually Amtrak got tired of the car taking up space and they started calling around for a solution. Eventually they called up George Payne, who has a way with these things and a rolodex the size of his… well, it’s big. He eventually arrived in Chicago, made a few calls, and headed up to Green Bay to grab a set of better brake shoes. It then took about a dozen guys, but he finally got them installed on the car. Of course, nothing can go smoothly. Part of the shipment escaped and went wondering around the yard. After rounding up the livestock, the car was finally ready to make its way east. Getting to Towson wasn’t going to be easy though since it didn’t appear on anyone’s turntable. They figured the first step was putting the car on the eastbound Broadway Limited to be then sent south on its Washington section. 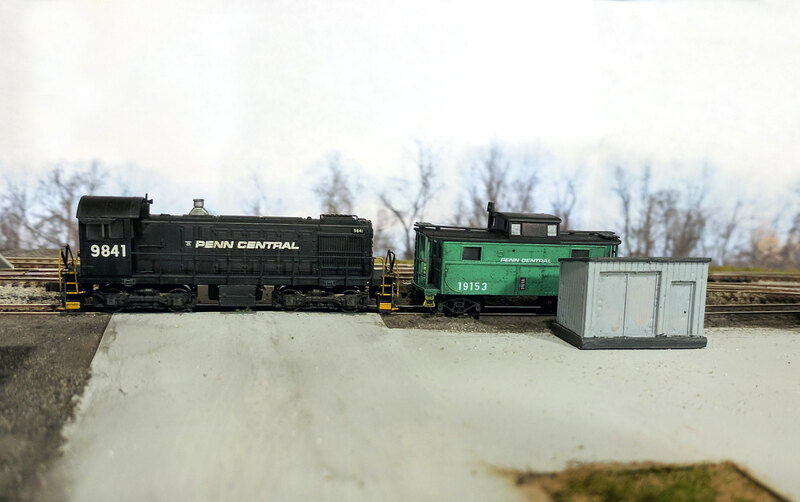 This block of sleepers, baggages and a coach gets cut off in Harrisburg sent south to Baltimore, where it then reverses direction for the short sprint to DC. 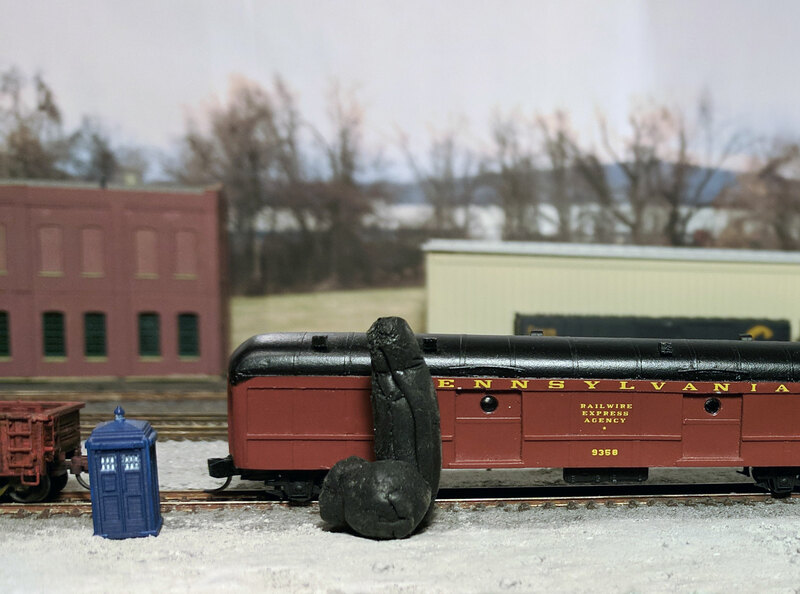 Since York is on the way, the plan was to drop the car off there where it’d get handed off to the shortline Maryland and Pennsylvania. The car on the tail end of the Little Broadway swinging onto the NCR at Wago Junction. “Black Bridge” over the Codorus Creek is one of the scenic highlights of the Northern Central. We almost missed actually seeing the car here though when Conrail train BAEN with SD40-2 6366 was making its way out of Windsor St Yard. We barely missed getting train f-ed. It was the a quick jump down to YORK Tower where Amtrak cut the car off the tail of the train. Does it really require a car knocker and electrician to come cut a single car off the train? You bet. You can tell how thrilled Amtrak was to handle a move like this by their attentiveness to the car in York. They just left it tied down on the main for a Conrail crew to come move around. At least they set the handbrakes. 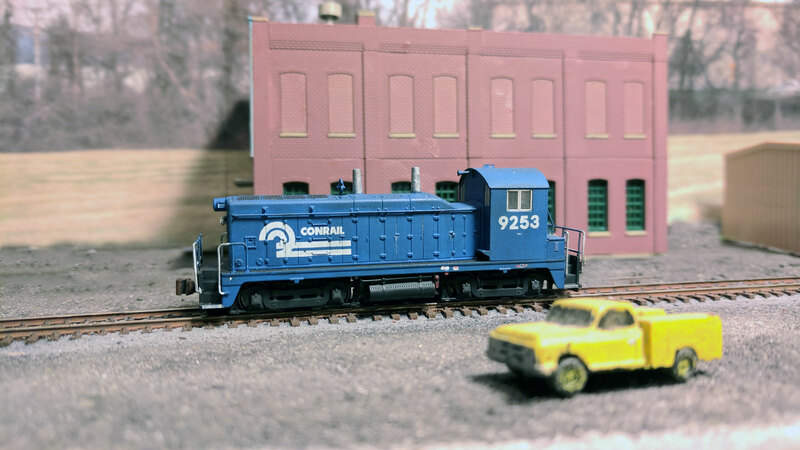 Conrail’s YHYK-33 yard crew had to come over to move the car the 100 feet to the Duke St yard. That’s where it was going to pickup its next shipment. Yermaams Erecting in York had a load for Killer Surkosky’s in Pittsburgh. Since the plant is no longer rail served they had to truck the shipment to Duke St and send it as an LCL shipment. Good thing the Railwire Express Agency was available. The freight agent took one look at the shipment and said “that’s too big to fit in there”. After a few attempts to both jam and jelly it in, she had to call up some additional specialized help. With the car filled up, it was time for delivery to the Ma & Pa.
After the car was set-off and WHYK-33 went back to work elsewhere in town, the York agent got a call: “You know we stopped going to Maryland in ’58, right?”. It sounded like there was a bit of an oversight in the plan. “Do you know who we work for? Do you know who’s behind this? It’s the goddamn Transcontinental PRR. They were able to change time, space and history, so you better figure out something before lose some more of your damned boxcars again.” Then he hung up. The Blue Room was contacted, and the only thing that fit the bill was an old Alco sitting in the Enola dead line. It turned out to be in ok condition, so it was fired up and sent down to York. The S2 finally arrived in York. The train was assembled, an air test was performed, and they were ready to head for Towson. Finally, we caught one last glimpse of the train was caught on its way down the Long Green Valley on its way to Towson. Hopefully the bourbon makes it intact… the sheep will be fine. LOL Ed! Was that black load scratchbuilt? You had me in stitches! Good lord! Poor Jim. I fear he will never be the same after this journey! Little known fact of said baggage car is that while the opening(s) have an accepted measurement, they don't stay one particular size. They change to accommodate whatever is going on at that time. "Wow! Look how nice that gon looks!" In other news, we now know where @rswinnerton 's lost weight went. It's odd that it took that shape, though.